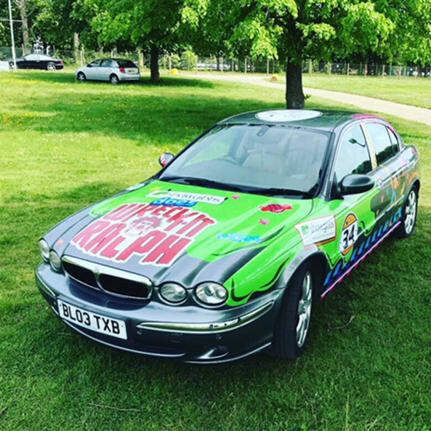 On 25th to 28th May 2018 a Shaw Gibbs team are taking part in the Twin Town Challenge 2018, a fun charity car rally where the teams taking part buy a £500 banger and ‘pimp their ride’. Then, over Spring Bank Holiday weekend, they take an epic road trip from Blenheim Palace to Le Touquet in France and (hopefully) back with the theme of the pimped up cars being ‘The Movies’. The Twin Town Challenge, which was established in 2014, takes place every two years to raise funds for a very brilliant charity SpecialEffect. To date the event has raised over £450,000. The Shaw Gibbs team will comprise of: Steve Neal, Sarah Gardener and Clifford Brown. Our theme, as suggested by Georgi Pacetti is the Disney film Wreck-it Ralph. 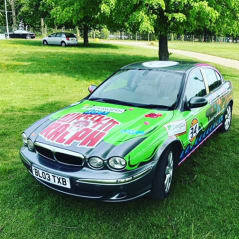 We have transformed an otherwise very ordinary X-type jag into the wonderful creation you can see above and the team will remain in their characters from the film throughout the weekend (follow @shawgibbs and #twintown18 for updates). Special Effect is an awesome UK charity with the aim of putting the fun and inclusion back into the lives of people with physical disabilities by helping them to play video games. By using technology ranging from modified joypads to eye-control, they are finding a way for people to play to the very best of their abilities. But they are not just doing it for fun. By levelling the playing field, they are bringing families and friends together and having a profoundly positive impact on therapy, confidence and rehabilitation. For some, this means access to fun and leisure activities like computer games. For others, it's giving them a voice at a time when they can't even speak. They don’t charge for their one-to-one support and they don’t sell anything. That’s why the fund raising for Twin Town really does count. Our fund raising page can be seen here.